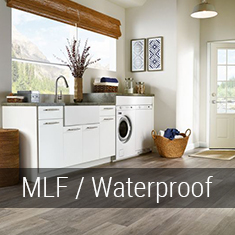 MLF Flooring - Kids, pets, parties and other daily messy scenarios can be a real nightmare, however, Multilayer Waterproof Flooring is a solution that can help you rest at ease. Multilayer Flooring comes in a variety of different styles and constructions, each with its own unique characteristics. WPC Flooring - The “w” stands for wood, but the fact is the majority of WPC type products entering the market today do not contain wood. WPC is a composite material made of thermoplastics, calcium carbonate, and wood flour. Extruded as a core material, it is 100% waterproof, rigid and dimensionally stable. The big advantage for WPC flooring over laminate is that it is waterproof and suitable for environments in which laminate shouldn’t normally be used—typically bathrooms kitchens and basements that have potential moisture issues. Waterproof Laminate Flooring - Laminate Flooring styles, with their waterproof construction and gorgeous hardwood designs, natural, tile and engineered vinyl planks are the perfect flooring options for any room in the house - even kitchens, bathrooms and mudrooms. Waterproof Carpet - New to the flooring market, comes the next step in waterproof flooring options, soft, beautiful colors and styles, and a level of durability not yet seen in the carpet industry. Installing a waterproof carpet brings with it an ease of maintenance, reliability, and comfort that the whole family will enjoy for years!